My oh-so-easy Green Stuff recipe. Do you have a favorite recipe from your childhood? Something that’s your go-to when you need something quick and easy…and completely yummy? My Green Stuff recipe, that you could find at most of our family gatherings when I was growing up, is that special recipe for me. I’m not really sure who it came from and what its proper name really is, but we always referred to it as Green Stuff. Probably because it’s….well, green. Everybody in our family, young and old, absolutely loved it. I’ve taken it to many parties and picnics since I started my own family and most people are afraid to try it. Probably because it’s green? I’m not sure but once they do, they love it too. Not only is Green Stuff beyond yummy but it is truly the easiest recipe to make, with just 3 ingredients. It would also be fun to add mini marshmallows or sliced almonds for a little extra crunch. I know, I know…it’s not very sophisticated, and not even a little bit healthy for you. Every once in a while it’s good to have something green and totally delish. Am I right? Have you ever had Green Stuff? Looking for some easy summer recipes for a get-together or picnic? Check out my post on 15 delicious cold summer salads! A quick and easy Green Stuff recipe that we always had at all of our family gatherings. So yummy and totally easy to make with just 3 ingredients. I’ve had that and its pretty darn good. So you drain the juice to make this? 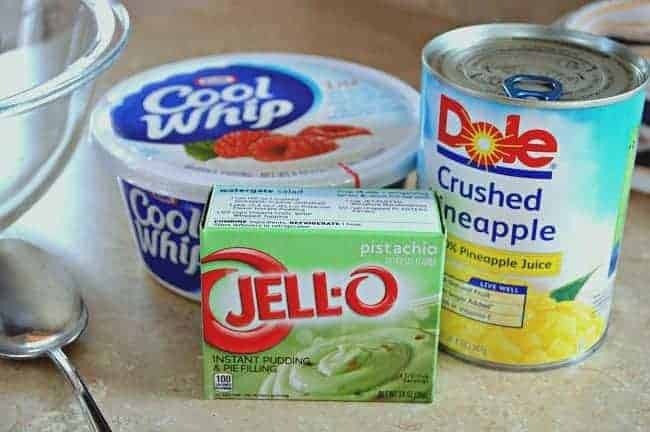 I am dying to use vanilla pudding and orange Jello!! Any quantity changes? Pistachio Salad! Ours has cottage cheese in it. We’ve had this as long as I can remember as a side to turkey dinners or steak suppers. Yum yum! My favorite green salad lol! We also add mini marshmallows and pecans! My fave too Sandra! My hubs likes it with marshmallows too but I’m a traditionalist. 😉 Good either way. I got that recipe from my mom, it’s an original Jello recipe called Watergate salad. I would love to hear how it got it’s name,when my mom passed away i found it in her recipes and i love it. I’ve heard that it is called Watergate Salad but I don’t know the origins of the name. Everyone in my family just started calling it Green Stuff and it stuck. Whatever it is called, we all love it here. This is so bizarre! For years my Aunt made this for all occasions – big or small. I named it Aunt Frances’s Green Stuff about 30 years ago and even though she is gone now everyone in the family still refers to it by the original name. Wow, so cool. 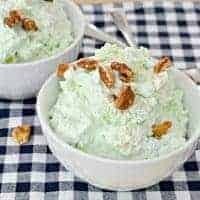 That’s how it was in our family too and although I now know that it’s called Watergate Salad, it will always be Green Stuff to me. 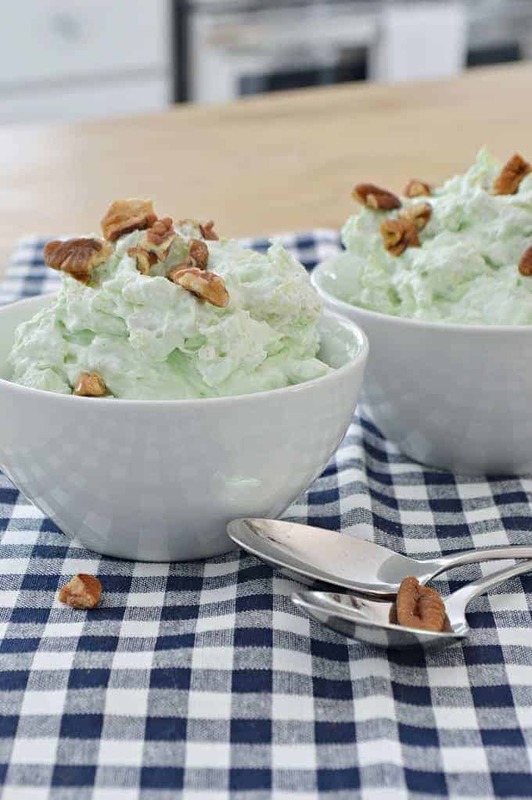 We call it Watergate Salad in the South…we add marshmallows and pecans! Sooo good! Marshmallows and pecans do sound good Debbie. Thanks so much for the info on my Green Stuff and for stopping by. Thanks for the recipe, it looks simple and really good. It is so easy and very good. Thanks for stopping by. So funny….I knew exactly what you meant when I saw the words GREEN STUFF…I have loved this dish for years. Thanks for sharing with the Thursday Blog Hop! Hi Kristi, just came over from SSS. 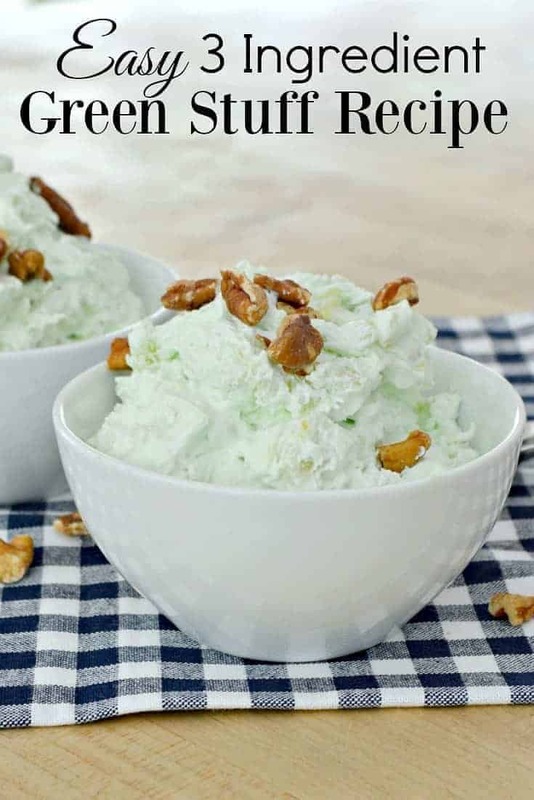 I’ve been around for awhile and this is called “Watergate Salad” because it was first served and was a signature salad at THE Watergate Hotel in Washington DC. Love this stuff and it’s just as good when you use sugar-free ingredients. Thanks for stopping over from SSS. You must get some pudding Dee and make it. You must…;) I think my Aunt is the one who started our tradition. This is a tradition I’d like to keep too…yummy and easy. Doesn’t get any better. Marshmallows sound good Kerry. I’ve had another type of fruit salad with sour cream and marshmallows. I’ll have to try it next time. Thanks for dropping by today and sharing your tip. I have had green stuff, not sure if it’s the same green stuff but I have always wondered what was in it. So now I know and can make my own 🙂 Thanks for the recipe! I didn’t know that you could find Green Stuff in the deli section. I’ll have to keep an eye out. Thanks so much for stopping in today Deb! I’ve never heard of “green stuff” but I’ve made a few different fruit salads throughout the years that have cool whip and/or pudding in them. My 22 yr old son loves that kind of thing so I think he’d also like the green stuff. I love to bake and pumpkin pie is what I’m asked to bring to the table. Funny thing is, I don’t even like pumpkin pie. I’m really surprised that so many have heard of it. I guess I live in a bubble. 😉 I would love to know if you make it and if your son likes it. Love the recipe, anything less than 5 ingredients is great! My baked beans is my signature. Sometimes I get tired of people asking me to bring it when I ask, “What do you want me to bring?” I just started making this Pumpkin Roll. It is delis because it has cream cheese in it, but that is the best part. I will have to write it down and send it to you. Oh, and my chocolate cupcakes with cream cheese and peanut butter frosting! Mmmm! I know what you mean MJ. Sometimes you just want to make a different dish. Everyone usually has their favorites though and they look to that certain person to keep making it. Oooo, your pumpkin roll sounds yummy. My cousin used to make it years ago but it’s been so long since I’ve had it. All this talk of delicious desserts has made me hungry…I’m off to get a snack! 😉 Thanks for sharing. My mom loves this stuff! I have no clue where she found the recipe for it, or if it’s something she always knew of, it just randomly showed up one holiday season, and she makes it for Thanksgiving and Christmas every year. It’s super easy, and no, not very good for you, but it has pineapple, so that has to count for something, right?! My mom goes back and forth between green and red. I asked for orange once, but she said that wasn’t festive enough, ha! My mom calls it “cottage cheese salad”, though – I think she forgot what the recipe called it years ago! Ha…great story. I think it’s easy to get hooked on it and I’m not sure if it’s the taste, the ease of the recipe or the nutritious pineapple ;). Anyway, thanks so much for sharing your family’s Green Stuff story.